Kurgo Tru-Fit Smart Dog Car / Walking Harness. $23.99. Very well made product. We used this harness when our Lab puppy was very young. It was most useful as a "handle" to control the puppy. Harnesses are made for "pulling" so it was not used as a training aid when training the pup to walk on a leash next to the trainer. Excellent product. We were looking for a seat belt harness and found this. 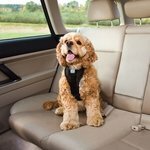 It is comfortable for my dog and is built with strong quality material that I have faith that it will keep my pet safe in an accident. Great harness.....fits like a glove, easy to put on and take off, provides great support when walking my Lab, excellent! This is great. Gus always went from back to front in the truck and it got tough to drive. This harness is great and it is much easier to put on him than the other brands that we tried. Two clicks and it's on. "This is the best harness." 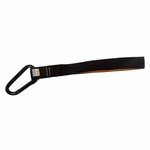 This is the best harness and easiest to put on harness that we've ever used. "After some adjustments, it fits him perfectly." At first I thought it was too small for our 6 1/2 week old GSP. However, after some adjustments, it fits him perfectly. We called Gun Dog Supply to see if we could return it, and they said we could. But now we are going to keep the small Kurgo Harness. Gun Dog Supply was easy to talk to, and they were willing to make things right. Gun Dog Supply is A+ in my opinion!!! my dog walks much better with this harness. Love the product, BUT the chest strap is too short. Will not fit as advertised. Unfortunately had to return. 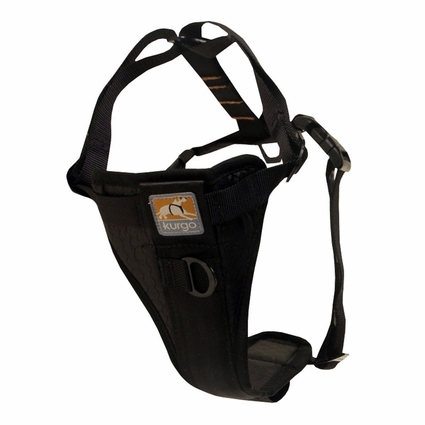 This harness is one of the easiest to get on and off, as it has two release buckles. Very adjustable as well. 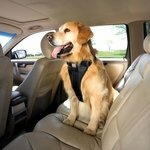 Fits well & will keep dog safe in the vehicle! Easy to adjust, easy to put on the dog, and comfortable fit for the dog. "Good fittings and straps, and the extra handle strap is useful." It's very sturdy and has good clips that are fairly easy for arthritic hands to open. Good fittings and straps, and the extra handle strap is useful. Works great and gives us better control when transporting the dog in the car. French Brittany. Hunts. Family pet. 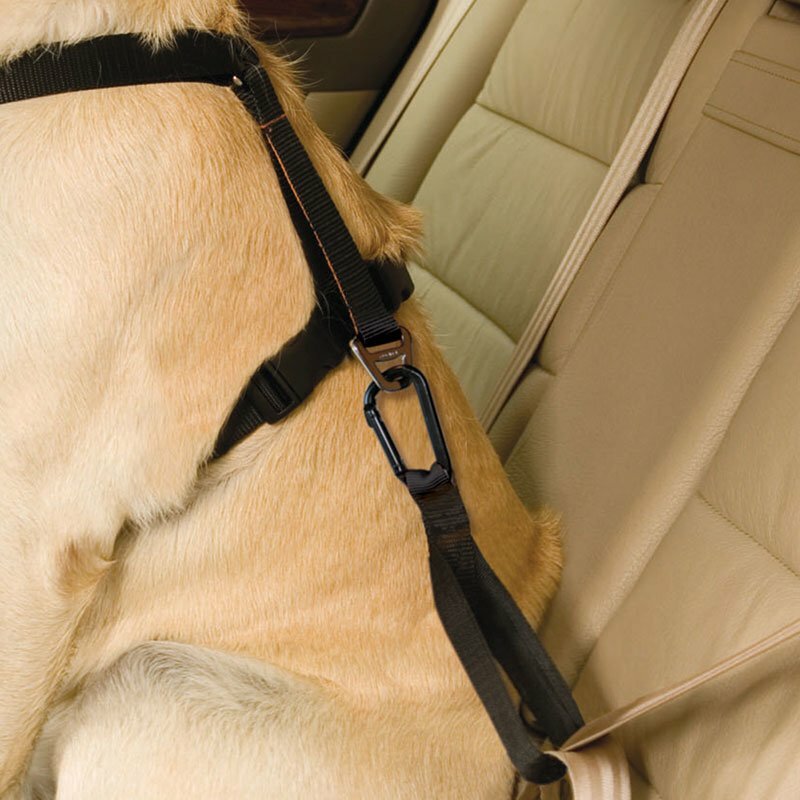 The Tru-Fit Harness attaches to the seatbelt when traveling. It gives him security and restricts his movement. It is adjustable and easy to fit to the size of the dog as he grows. This is also a very good harness when walking your dog. "Makes car rides safer for the dog and other passengers." german shepard/ german shorthair. Hunts. Family pet. Our do loves the harness for both walks and car rides. She sits in the back seat of our truck and waits for the harness. Its nice to know she is buckled in and secure instead of becoming a 65lb missile in the event of a sudden stop. Makes car rides safer for the dog and other passengers. Also she seems more comfortable on walks in town with the harness on. Hungarian Visla. Hunts. Family pet. The hardware(buckles) rattle a little,but lets me know when Bodie is on the move. This appears to be a very well made collar. It is not a cheap thin collar and should last a long time. I will buy again. 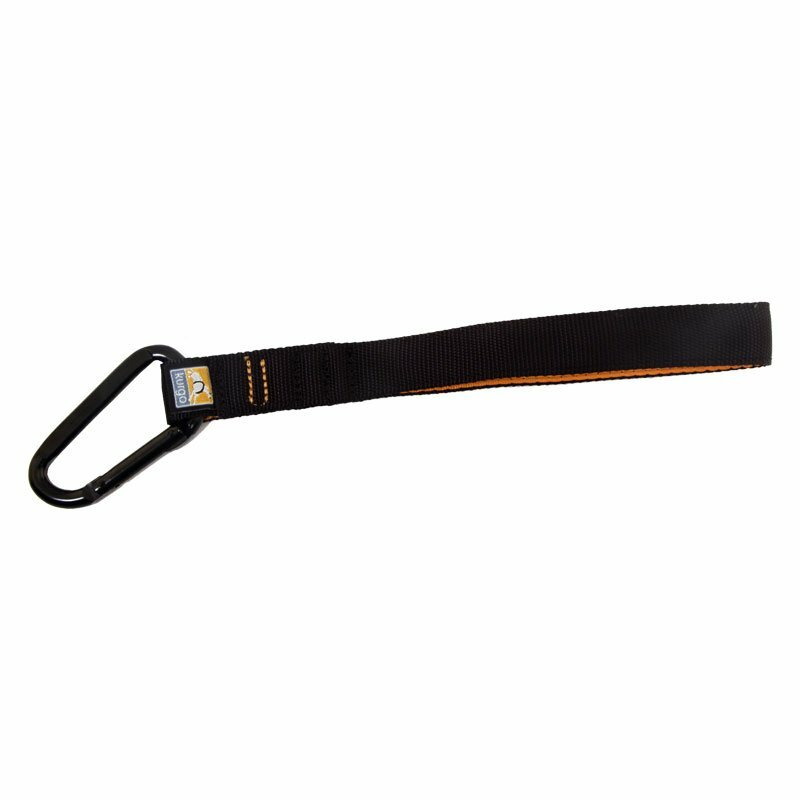 Perfect for use as a vehicle safety vest or walking harness. 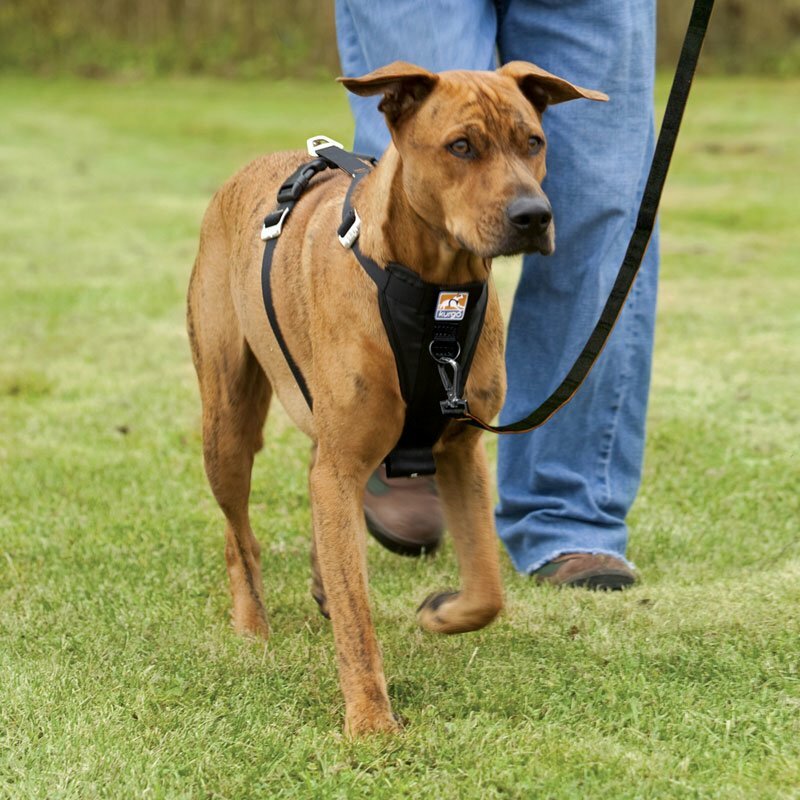 As dog owners themselves, Kurgo's designers know a dog harness has to be easy to put on or it will not be used. As a result, the Kurgo Tru Fit Smart Harness is one of the easiest to use harnesses on the market. For durability, the Tru-Fit Harness uses high-quality automotive materials such as nylon seat belt webbing plus a padded chest piece for added comfort and safety. Black with orange details. Available in X-Small, Small, Medium, Large, and X-Large. Using in your car or truck? Consider adding the Kurgo Swivel Tether. X-Small -- fits dogs 5-10 lbs. Small -- fits dogs 10-25 lbs. Medium -- fits dogs 25-50 lbs. Large -- fits dogs 50-80 lbs. X-Large -- fits dogs 80-110 lbs.